I began this series of posts about Yoeme (Yaqui) Pascola masks on July 4, 2016, one year ago. Back then, I had no idea that I would stay with this subject for an entire year. Today I will conclude with five excellent masks by identified carvers whose output was less prolific, so they are less well known, yet well worth knowing. All of these are from a private collection that has passed through several hands in recent years. I took these photos several years ago when they were in the collection of David West, of the Gallery West in Tucson, and I am grateful for his permission to photograph and publish these examples. This magnificent old mask was reportedly carved by Felipe Reyes of Loma de Bacum, Sonora, in about 1961, and it was subsequently danced by Juan Sol Valencia for 20 years. It appears to still have its original paint, which is definitely showing its age. I surprised myself by finding so much to say about Yaqui Pascola masks that I posted on that subject for 11½ months. I wondered whether there was anything left to to write about, thinking that I might as well make it a full year. Sure enough, I found a few more clusters of interesting masks. This week I will turn again to anonymous masks that have tormented me for one or two decades. Those from my collection are some of my favorites. 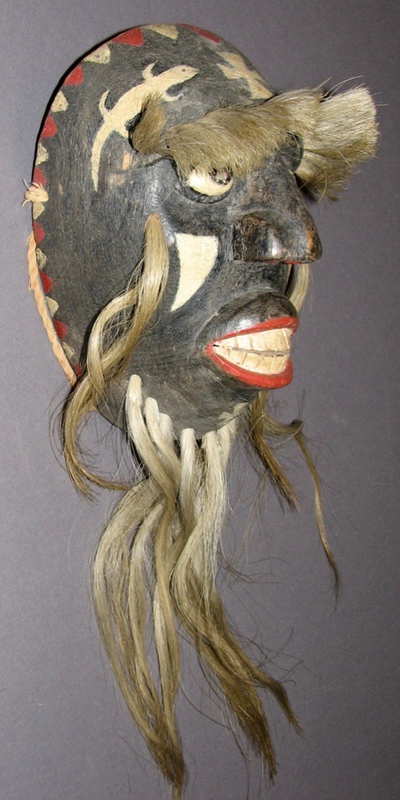 I purchased this mask from John Kania and Joe Ferrin in Santa Fe, in 1991. It was obviously old and wonderful, but it came with no history. This mask apparently had inlaid mirrors on the cheeks, which are now lost. Also notable are the inscribed decorative scrolls on the forehead and cheeks. Last week we took advantage of Danial Moreno’s trademark oversized noses to recognize a few otherwise anonymous masks as his work. But there was another anonymous mask with an oversized nose that I didn’t show you, because it didn’t sufficiently resemble Daniel’s masks. Then it occurred to me that there is another carver of big noses for us to bring into such a quest, and that is Beto Matus. I have already introduced him in my examination of the goat faced Pascola mask at the end of my post of May 29, 2017 ( https://mexicandancemasks.com/?p=9855 ). Here is a full set of photos of the Beto Matus mask from Tom Kolaz’s collection. Ironically after I first saw these photos several years ago, I realized that there was an identical mask in the collection of the Arizona State Museum, although that one lacked an identified carver at that time. Again I thank my friend Tom Kolaz for taking these photos and for allowing me to show them to you. Today I have the pleasure of showing you a series of Yaqui Pascola masks that were carved by Daniel Moreno of Hermosillo, Sonora. I will show three that were either purchased directly from the carver or confirmed by him, and these will demonstrate his typical stylistic features. However, they certainly do not demonstrate unformity of design. Drawing on this variety of features, we will examine two more that I have attributed to Danial on the basis of their similarities to the other three. As you will see, this carver’s most characteristic feature is a very large nose. This mask and the next were collected from Danial Moreno in January 1981, in Hermosillo (Sonora), by someone who wishes to remain anonymous. They have subsequently passed through various collections. I am grateful to David West, the owner of Gallery West in Tucson, for allowing me to take and publish these photos. This one had reportedly been danced for 23 years. Isn’t this a dramatic mask!